So the wonderful Cris of www.queenofthecatpeople.com posted suggestions of ways I could save more. And I realized, I am doing these. Well, I don’t do once a month grocery shopping-I keep an eye out for coupons, buy my staples when they are on sale if I can, and then just pick up things as needed to supplement them. Since I’ve started tracking my expenses I’ve been very good about not making unplanned purchases at the grocery store unless I see a sale, so it doesn’t matter how often I go. If I try to plan too far ahead I always end up wasting something. 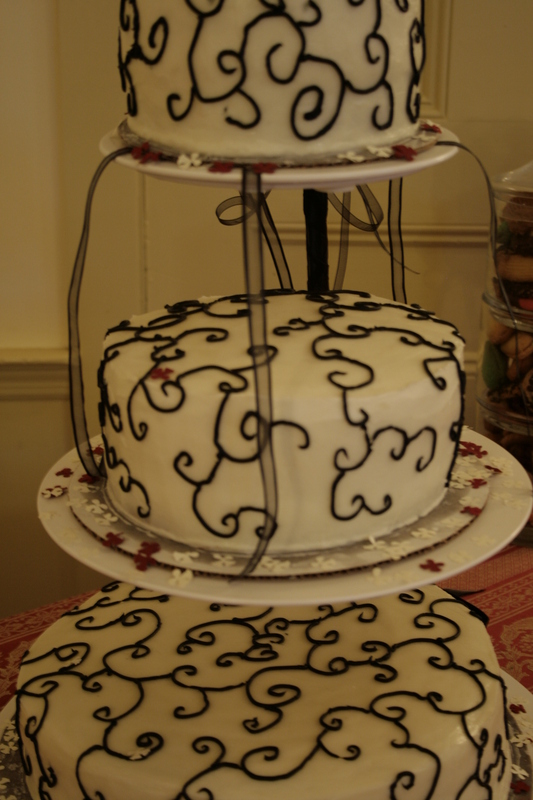 My favorite shot-the cake I made. Photo by Steph Flanders. And then I realized, go me. I am already doing a lot. My close friends got married, there was bound to be some expense involved. I had to pay for cake things, part of a car, part of a hotel room, and shoes. These were all optional (well, the cake really wasn’t at this point)-I could have taken a train I suppose, and not stayed in the hotel, and worn shoes I own or borrowed some. But this was not just one of the biggest days of their lives, it was one of the biggest of mine, That’s what having money is for. Ten years from now I am going to value the memories of the weekend far more than what they cost. In the meantime, most of the point of being so careful with my money is so I can spend on what I care about most, which these people certainly are. But I knew that, and it is okay. That’s not something that’s going to set me back on a regular basis, and I won’t have to budget so tightly to make things come out okay in months where that isn’t happening. I have already planned for holiday gifts and I think my expenses shouldn’t be too bad, except for a couple people I don’t have gift ideas for yet. I also now have cat supplies for the next several months because I decide it was more important to get the best possible price overall than to fret about my weekly budget, and buying in bulk is cheaper. So next month I am going to try week-to-week budgeting again, but I’ll be able to give myself more leeway while staying within my overall monthly budget. And this month, I am just going to do the best I can in the remaining weeks. I just need to focus on the good, and remind myself that big expenses happen. Entry filed under: goals. Tags: goals-2008-october. Oh wow, that cake is amazing! Great job. Ever considering going into cake making as a career? I am, unlike most brides, awesome. Q.E.D. Seriously, though, you do amazing cakes and you’ve only been doing it seriously for about a year. It’s definitely something to keep practicing on the side. And OMG does Steph make things look awesome and amazing and crisp.